Launched in May 1911, the triple-screw steamer Titanic was the pride of the White Star Line and at that time the largest passenger ship in the world. Built to carry passengers in comfort and luxury on the lucrative transatlantic route, her design, fittings and on board facilites epitomised the spirit of the age in terms of elegance and style. 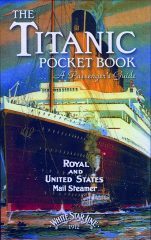 Titanic Pocket Book: A Passenger’s Guide is a unique guide to all aspects of the ship, incorporating authentic period literature. The book covers details about the White S tar Line and the builders of the three sisters. It then goes on to discuss the design, construction and launch, followed by comprrehensive information for passengers in all three classes of accommodation. Finally it discusses the operational, safety and navigation of the ill-fated vessel. This is a nice coffee-table type book with some good photographs and illustrations and I would recommend it.